long-time friend Dorothy Harris and her family in Jamaica and Canada. Funeral Service was held on the morning of Friday, November 8 at The Life Centre, 2214 Innes Road, followed by the interment at Beechwood Cemetery. Donations to the Alzheimer’s Society or the Canadian Cancer Society in Mrs. Robinson's memory would be appreciated. spirit"! Your hospitality, warmth, love and care will never be forgotten! Thank you and "walk good", Mrs Robinson! wonderful staff at the Heart Institute. In lieu of flowers, memorial donations to The Eldercare Foundation of Ottawa (www.eldercarefoundation.ca) appreciated. broadcaster, civil servant, researcher, and best-selling author. pavilion, for the respective world Expos. As a senior information officer for the United Nations Environment Programme in Nairobi, Kenya, she developed and launched a worldwide campaign known as "For Every Child a Tree". Reads 2005, championed by Olympic fencer Sherraine MacKay. following complications from a stroke. She was the mother of Jeremy Hodge (deceased, 1979) and noted Canadian pioneering film-maker Jennifer Hodge de Silva (deceased, 1989). activist, artist, musician and Caribana founder....We have lost a giant among the icons of black empowerment in Canada. May we and future generations emulate his unwavering quest for justice and unconditional pride in our black heritage. Rest in perfect peace as you take your place among other esteemed freedom-fighters who have joined the ancestors. There was a memorial for Charles Roach on Saturday, November 10, 2012, in Convocation Hall at the University of Toronto. 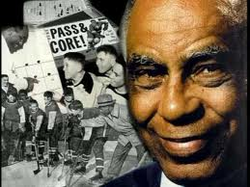 distinguished himself in the Royal Canadian Air Force during World War II. 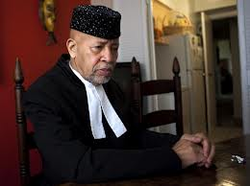 He graduated from Osgoode Hall Law School in Toronto in 1953.
a vice-regal position in Canada. He served in that capacity from 1985 to 1991. 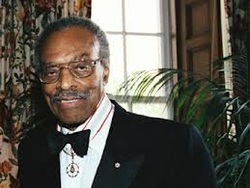 In 1992, Mr. Alexander was awarded the Order of Ontario. He also became a Companion of the Order of Canada. Toronto, on Monday, October 22nd, then at Hamilton City Hall. A state funeral took place on Friday, October 26th, at Hamilton Place, in Alexander's hometown of Hamilton, Ontario. encouragement, unwavering support and wise counsel, mourn the passing of a great Canadian statesman, a champion for Canada's youth, a generous philanthropist and stellar community leader.....You have more than earned your rest, sir! We salute you! elected to the Etobicoke Board of Education and Etobicoke City Council. 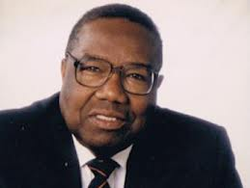 Mr. Braithwaite went on to become Ontario’s first Black Canadian MPP for Etobicoke North, thus becoming the first Black parliamentarian in Canada. gentleman, mentor, role model, philanthropist, activist, father, grandfather, community leader....May his Future Aces legacy continue to live on in all the young lives he has transformed. Rest in peace, sir. You have truly earned your rest. 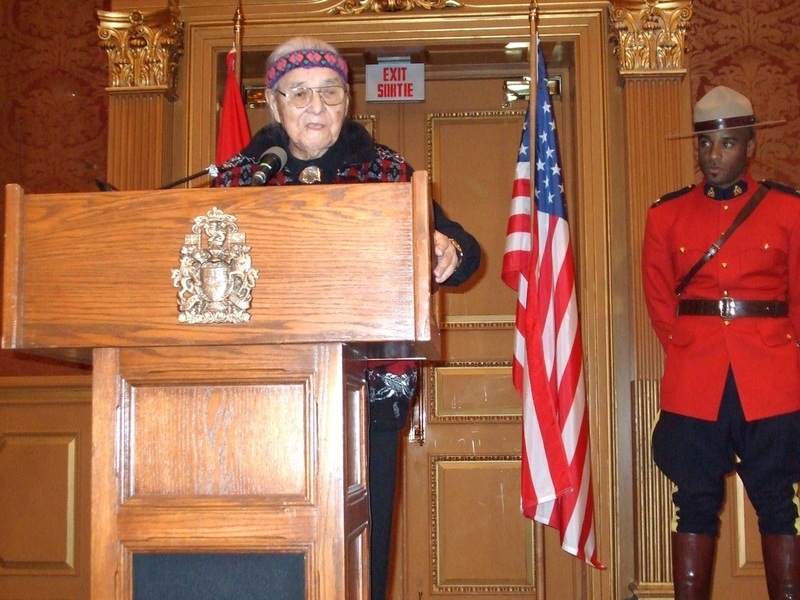 William Commanda, OC (Anishinàbe name: Ojigkwanong) (November 11, 1913 - August 3, 2011) was an Algonquin elder and promoter of environmental stewardship. 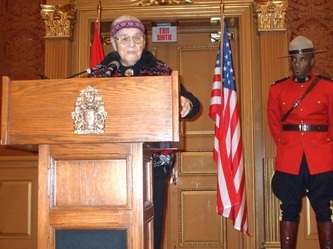 Grandfather Commanda served as Band Chief of the Kitigàn-zìbì Anishinàbeg First Nation from 1951 to 1970. Grandfather Commanda worked as a guide, trapper and woodsman, a birch bark canoe maker and craftsman. Grandfather Commanda was Keeper of several Algonquin Wampum Shell Belts which held records of prophecies, history, treaties and agreements. 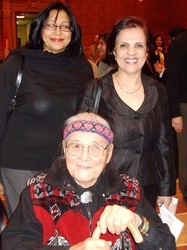 In 2008, he received the Order of Canada. Thank you, Grandfather William Commanda for your vision and leadership. It was a privilege to even be in your presence, let alone to hear, in person, the valuable wisdom and lessons you were brought here to share. May you now rest in peace and may we, who are left, honour your legacy by applying what you've taught us. Amen. 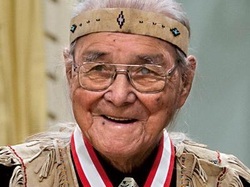 Algonquin elder Grandfather William Commanda was a First nations Elder Statesman who, with humility and reverence for his fellow man and Mother Earth, devoted his entire life to promoting peaceful coexistence between the races and between humanity and the environment. 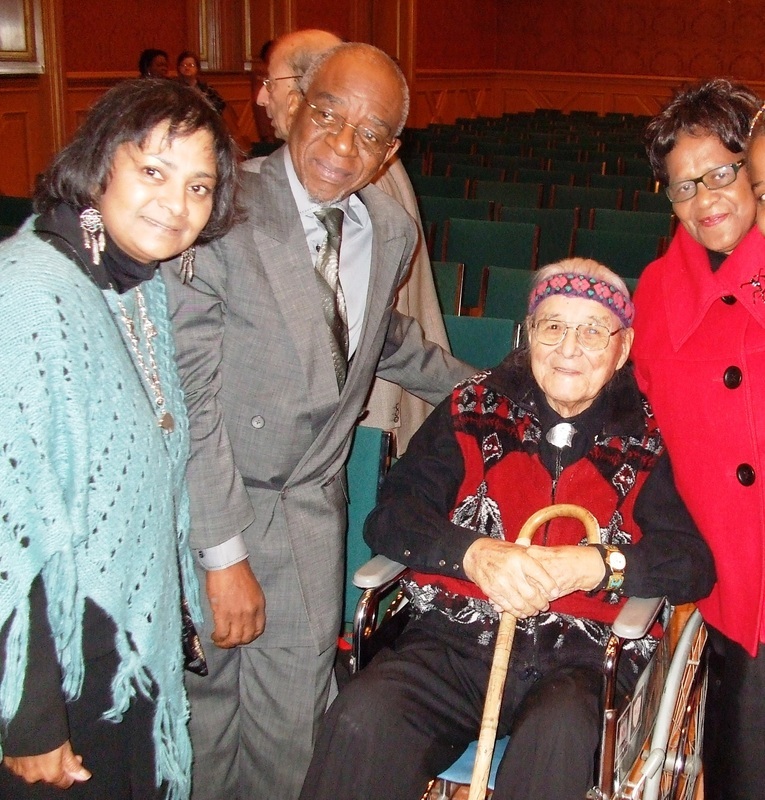 On January 18, 2010, on Parliament Hill, in Ottawa, the black community, through the Canadian Martin Luther King Day Coalition, recognized and celebrated his many contributions, by presenting him with a crystal 2010 DreamKEEPER Life Achievement award. An excellent gesture indeed to honour the legacy of the late Dr Rev. Martin Luther King Jr recognizing an elder he inspired! FRITH, May Beatrice. On Monday, July 11th 2011 at the age of 86, May Beatrice Frith made her transition peacefully. She will be missed by her brother Kenneth (New York) niece Sylvia Williams (Ottawa) other relatives, nieces, nephews and friends (Jamaica, USA, Canada). May was a Professor of Linguistics with the University of McGill for many years. 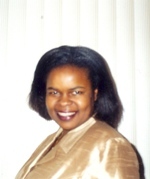 She also founded the Harambee Education Centre Ottawa Carleton; a division that focuses on providing opportunities for black youth of Canadian Caribbean descendents. All are welcome to pay respects at the Kelly Funeral Home 585 Somerset Street West (Centretown). Visitation Friday, July 22nd 2 to 5 p.m. and 7 to 9 p.m.; Funeral Saturday, July 23rd 10:00 a.m. at First Baptist Church, 140 Laurier Ave., West. Final resting place Maidstone Manchester Jamaica WI. In Memoriam donations can be made in her honour to the Boys & Girls Club of Ottawa or The Canadian Diabetes Association. CELE, Zanele. Passed away suddenly on Monday February 14, 2011 at the age of 32. Beloved son of Grace Cele (nee Mkwayi) and the late Edward Cele. 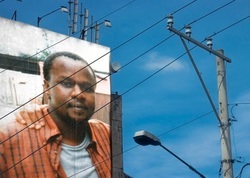 Loving brother of Themba, Lindiwe, Monde, Sipho and Mfana. Will be dearly remembered by many aunts, uncles, cousins and dear friends. FUNERAL: Friends gathered for his home-going at the Ottawa Church of God, 1820 Carling Ave. Saturday, February 19. "Zanele Cele was granted his angel wings on February 14, 2011. Zanele’s life would seem too short to many, but those who were touched by him understood that the quality of existence far exceeds the quantity of time in which one lives. His gently smile,soft voice and his gentle attitude brought so much joy to many and family. The family thanks the kind health professionals who have cared for Zanele for their dedicated care. Thanks to the staff of the Ottawa General Hospital and the Heart Institute." Charity left us on Monday, October 11, 2010, at the age of 42, after a long and courageous struggle which she faced with extraordinary dignity and grace. She is the beloved daughter of Benson and Beatrice Osome; dear sister of Brody Robert Osome and Burton Victor Osome. She is fondly remembered by many aunts, uncles, family members and friends. The family extends a special "thank you" to the staff of the Coswig Hospital, Germany, the Princess Margaret Hospital, Toronto, the Ottawa General Hospital and the Elisabeth Bruyere Health Centre and to all of the friends and relatives who visited as well as to the Metropolitan Bible Church for their support. Friends visited at the Central Chapel of Hulse, Playfair & McGarry, 315 McLeod Street (at O'Connor) Wednesday, October 13, 2010. The funeral service was held at the Metropolitan Bible Church, 2176 Prince of Wales Drive, on Thursday, October 14, 2010 at 11 a.m. Interment followed at Pinecrest Cemetery. In Memoriam donations to the Bruyere Foundation appreciated. "But I want to be specific, because it is a more than a crying shame that with over half a billion dollars raised for cancer research through Terry Fox Runs alone – around the world, we STILL have not been able to save people like my twin sister from the VERY EXACT condition (bone cancer) that Terry Fox inspired the world to fight three decades ago - and my sister has now gone to join him. The problem is not money. I encourage all of you to collaborate with me to bring public awareness for research funding and support to be directed equally to Sarcoma as it is directed to others about which we most commonly hear. It is a crying shame that my parents, who are very qualified in their medical expertise, had to twice leave Canada with Charity to take her to Germany because they have had success in their battles with various cancer conditions including Sarcoma – but here, in Canada, with all that is said about health care, we cannot take some of that half billion and benefit from the best practices of the Germans. My friends, I encourage you to join me in this campaign.